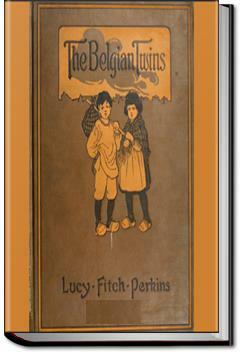 This story is based upon the experiences of two Belgian refugees in World War I. When their parents are marched of by Germans, Jan and Marie are left alone. Now they, along with their dog, have to find their parents! . . .they were met by an officer, who at once took command of the company. There was only a moment for hasty good-byes before the order to march was given, and the women and children watched the little column stride bravely away up the street toward the armory, where the uniforms and arms were kept. They followed at a little distance and took up their station across the street from the great doors through which the men had disappeared. There was little talking among them. Only the voice of the priest could be heard now and then, as he said a few words to one and another of the waiting women. It was still so early in the morning that the streets of the city were not yet filled with people going to work. Only those, like themselves, concerned with the sad business of war were abroad. Based on true events, this little story is a delight to read. One gets a real feel for the plight of the Belgians during WWI, as seen through the eyes of two children. Highly recommended. This is one of the first books I can remember reading. My father told me he had read it when he was a boy. He was born in 1917 so the book would have been almost new when he read it. This book showed me a place and time very far from my own.